S&P completing a major topping pattern? What a past 4-months its been for the S&P 500! It hits its 261% extension level of the 2007 highs and 2009 lows in late September and it then proceeds to fall nearly 18% in the last 3-months of the year. Following this large decline, the S&P closes the first month of the year with a very impressive rally, gaining around 9%. What clues might we look for in determining if a topping process is in the making? One clue should come from the bond market! 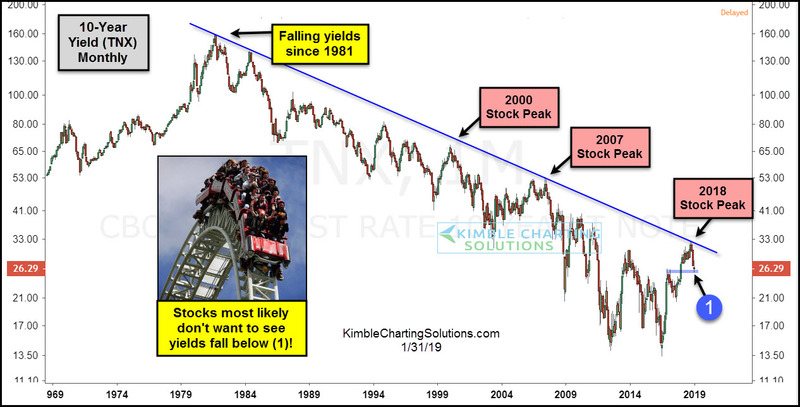 The 10-year yield has created a series of lower highs since the early 1980s, creating a strong falling resistance line. When yields came near this falling resistance line in 2000 & 2007, yields peaked and so did stocks. As the S&P was hitting its 261% extension level last fall, yields were hitting this multi-decade resistance line at the same time. After hitting this resistance line, yields fell hard and stocks did as well. Yields are now testing an important support point at (1). Joe Friday Just The Facts Ma’am-What yield do at (1) should go a long way to determining if the S&P is making an important topping pattern!